Table Size: 72″x 48″ (LxW) In Inches (4 piece folding unit) ; Chair Size: 22″ inches Height Approx. 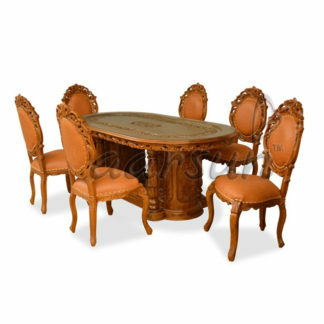 Traditionally Handcrafted Stylish 6 seater dining sets perfectly crafted to experience a royal life. Aarsun Woods presents solid wood 6 seater dining table in multiple options like luxury, traditional, contemporary and modern. Teak wood 6 seater dining table and chair are available in various trendy shape like square, rectangular, circular and oval.An elegant panache sturdy furniture can make your home come alive. The modish designs of Handcrafted Wooden Dining Table Set from Aarsun Woods will create splendid Decor of your Home. Make your every meal a special occasion or Host a special dinner for your friends with marvelous designs of wooden Dining tables from aarsunwoods. The simple yet sturdy craft with graceful walnut finish will make unique style statement in the decor. The beautiful carvings over the table legs makes the wooden dining set very appealing.Combined with elegant walnut finish, the table will adore your Beautiful functional Dining hall. 6 seater dining set has captivating looks and can easily blend with any home interior. The product can be used for multipurpose like dinner, party or a small get-together. Sophisticated looks of the product will get you lot of compliments.